Hi my name is Lisa. I live with my husband 1 teenager and 1 preteen...we are owned by a couple fids but this journal is about Indy and to advise those considering parrots who will end up letting them almost rot away after the newness wears off....buy a stuffed animal! Maybe borrow someone's 2-3 year old toddler for a month or so. If you can't handle that...chances are good you will buy a parrot and it will eventually end up dead or at a Rescue. This precious bird is only alive because of Mike and Abi! Iowa Parrot Rescue They rescued him from 13 years of being cage bound! Imagine being stuck in a small room for 13 years with no contact!! Sounds like a great life doesn't it? The first time I met Indy I fell in love with him. He was a very very sick bird. He had plucked a lot of his feathers..(hey what else could a bird find to do in a small cage and no toys?) and what feathers he did have were dull and almost colorless. His face was swollen from having cigarette smoke blown on him. I won't get on a rant about animal abuse because that's not what this page is about...and it would only raise my blood pressure. So let's assume those of you reading this page are not in that category of bottom dwellers. We were the lucky ones who got to bring Indy home and continue the work that Mike and Abi started. So away we go.....March 28th am. what a great way to wake up this morning by a new voice!...."hello"! It was Indy!! After spending a night in a new place Indy was still glad to see someone. He seems to have taken to the new cage and I must have put all his toys in ok. He loves his bell and is happy to show it off to anyone who walks too close to the cage. After being cage bound for 13 years Mike said it will take some time for Indy not to be territorial and feeling more secure in the cage for until he took him that is all he knew. I guess it would be like that little room I mentioned being locked in ...then set free but only knowing that little space so being afraid to venture out! We will take this transition slow. March 29th 2003 Day 2! Again Indy awakens with a cheerful greeting of a light bell ringing and a gentle "hello"! We begin the morning with the cage door open and the option of coming out or just playing in the cage until breakfast is served. Then again...would you like to come out or would you like room service is offered. Today it was "I'll take the fruit and cereal in my suite. "...after the settling of all our stomachs we then proceed with the irrigation...which he comes out for with my husbands coaxing. Indy really likes him! Which is fine! The rest of us will bond with him too but maybe Indy will bond more with him. We have learned to be flexible here. Irrigation is over and Indy returns to his cage where he takes a short bird nap. Ohhhh this is a funny story... yesterday right after irrigation Indy hopped down and made a bird line for the couch...which is directly across from the quaker cage. Sammy was in our sons room so Indy found the opportunity to "check out his quarters"....a little too tight but he ran in and then gave us a good hearty laugh. Luckily the quaker cage has a lift off top and so we got him out that way. I think he thought this was a terrific game. 3/30/2003Well guess who decided to eat breakfast with us today... OUR breakfast consisted of oatmeal, toast and grapes. Indy liked playing the game of mom takes a bite of oatmeal then Indy takes a bite...mom takes a drink of coffee...Indy takes a drink of water. We had a great time. Indy has started the game of one of us coughs and he coughs.....BUT this cough almost sounds like the mimic of a person who smokes coughing. ...so we are wondering if the woman who blew smoke on him also had smokers cough and Indy is remembering that. We are so loving this bird! 3/31/2003 am Today Indy decided to play for awhile with us at the table but wanted breakfast in his suite. Indy does this really kewl Stevie Wonder impression while whistling! PM Well we had great fun playing ball today. Indy throws and I fetch! This is what I think may have meant to be a warning ....we have had enough of a photo shoot! another great day and more progress. Indy now comes out of the cage willingly and goes up and plays with the toys on top. When he is ready to go in he just swings the door open and goes on in. Guess he heard the quaker saying "peek-a-boo" enough..he has started saying that if you peek under his sheet! He knows when I am getting the oatmeal container out and starts dancing. Indy had it all over his face and flung all over the table. Bath time (misting) still does not seem to be something that Indy likes. Playtime was a great time today. 4/4/2003 We tried a different approach to bath time today...we managed to at least check-out the bathing facilities today. 4/6/2003 Great time today...Daddy spoils Indy with a place to climb so when he is playing "fetch moms feet"...he can climb back up to his condo! I think I should be wearing a shirt with Indy's picture on it and the logo "Piercings by Indy". I am sporting a matching hole on my arm and the top of my foot. 4/8/03 Received a very loving email and an award!! 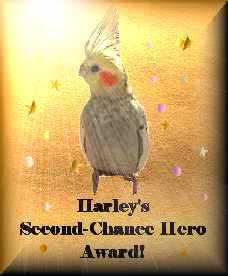 We gratefully accept the award and give very much deserved credit to Indy's health to Mike and Abi of the above mentioned Iowa Parrot Rescue. We will continue to give Indy the best home life possible!!! Please click on the award picture to visit the Pampered Perch and thank you so much for the award! 4/9/03 SCORE for Mom....while changing the paper in Indy's cage and deciding if he wanted the sports section or the classifieds he came down and checked out what I was doing. Greeting me with his cheerful "hello"..."hi"..."come here". I finished changing his cage (we decided on the sports section) he gave me the look of "I want to step up". I thought what the heck one more flesh wound isn't going to matter....but he stepped up onto my HEAVILY SWEATERED arm. We then went into the kitchen and sat at the table....of course there wasn't anybody around to take a picture of this so you will have to take my word ..it really did happen. I am so thrilled!! I think he is starting to trust me. Not all women are like the one he originally lived with!!! I just want to say thank you to all the folks on AOL who have kept up with Indy and are sending us encouraging emails. I have yet to run across a bird chat board on regular web where the people are actually helpful and friendly. 4/14/03 YAY....Indy will now let me scritch his neck and seems to enjoy it. We have discovered this purring noise that we can both make and that's a little clue that it's ok to scritch. I also say "kiss" and he looks up and makes a kissing noise. What a sweetie! Indy imitating Groucho Marx. Don't come any closer. 4/23/2003 Well this just keeps getting better and better. Indy and I are learning to trust each other more and more each day. Indy knows now when I am going out on the deck and I will say.."outside? "..if he lunges I go out alone and come back 5 minutes later and ask again. It usually only takes one time of doing that and he climbs on my shoulder and out to the deck we go. Now if one of the cats were on this island...Indy would be scolding :) but he decided that this is the best spot to supervise the making of the meal. 4/24/2003 No pictures today but more fun. Indy helped me rinse dishes tonight. He was on my shoulder and saw the sprayer and just had to go test it out. He gave us both a shower. What a blast. Also if anyone could explain to me why birds think they are all dermatogists? I am 40 years old and was promised not to have pimples as a passage of rites into the 40's!! WRONG...and Indy and my senegal Kiwi always feel the need to point them out to me...like I don't know they are there. Then they feel the need to help me take care of them. YOUCH! It's a good thing I don't get anymore than I do or I would be a real mess! 4/25/2003 Daddy made Indy a swing and boy did he have fun checking it out. Guess it passed his inspection. Out on our screened deck catching some breeze. NOW....Indy is my shoulder bird. I think hubby might have eased out a little knowing how much I wanted this to be my bird. He still likes him but now he wants to go with me all around the house. That cage that once was a safe haven and all he knew is now "bed". When it's time to go to bed we set him on the perch outside the cage and turn out the light by him. He makes no fuss and goes right in and waits for the blanket to cover him. We go through the ritual of purring and kissing and a couple "come here's" are heard but soon it's quiet and we wait for the next morning to come out and do it all again. I think Indy is happy! And we KNOW I AM! 5/1/2003 Indy takes a bath! July 5,2003 It's been awhile since I have written but be assured that we are progressing still faster than I ever expected. Our latest victory was being able to get Indy leash trained so that he and I can go for rides in the car, visit the pet store and go to the park to feed the ducks...well Indy says.."one piece of bread for them and 2 for him." He draws quite the attention when out in public. Of course kids especially want to know why he doesn't have all his feathers which leads me right into the story about how people want parrots and then find out they are a lot of work and don't take care of them. I guess that is kind of for the benefit of the parents who might hear "I want one of those" when they get in the car. He loves to go through the drive through at our bank and whistle to whoever is in the window. His favorite activity is still hanging out on the deck. Which we have to do either real early in the morning or wait until dark because here in Iowa it's so hot and humid you can't stand to be out very long at one time. Another favorite activity is going to our local pet store and visiting Nathan who works there. They get along great! I'll post some of our new deck pictures...notice all the new feathers coming in. Ones I thought would never grow back are coming in. New Tricks Indy has learned some new tricks since the last update...he now says "good bird" which comes out just like a toddler (sometimes only the mother can understand it ;)...he says baby. which we incorporate into a nightly routine of me singing "rock a bye baby. and when we come to the baby part that is his solo." That is ONLY a night time thing. Routine Routine Routine! He also says Peek-A-Boo sometimes letting me say everything except "boo" which again is his solo. Speaking of peek-a-boo...find Indy...he's the lump in the middle of the paper. Fun game! 8/18/2003 Boy look at how the time has flown. Indy just keeps getting better looking all the time. Look at the pretty bird! we were both wet as were the walls, hutch etc...what fun! 8/26/03 Deck picture of Indy and Napoleon relaxing! 8/27/03 Well 2 big birds on the deck at one time can be like sticking 2 toddlers in the same playpen...Indy wanted on the swing so I put Naps on the jungle gym...Indy didn't want to be on the jungle gym nor did he want Naps playing on it. LOL! Indy vocalizes and demonstrates his irritation at Naps being on the jungle gym by taking it out on a paper towel. Even the name brand variety could NOT stand up to Indy! 11/24/03Well well we have an escape artist living with us. I left to go to youth group leaving a secure macaw in a locked cage -- only to come home to the end of a tail feather disappearing into an open cage door! Time for some heavy duty locks! "What?" "I'm innocent I tell ya! ""The cat let me out?" 12/8/2003 Look it's a partridge in a pear tree! No wait it's a severe macaw in a Christmas tree. Indy apparently did not think this was a good time to be weighed. Btw.. we did get him out and he is weighing a whopping 395 grams. 2/15/2004 Wow in a month and a few days it will be a year of Indy joining our family. Guess we better plan on a celebration! Thought I would throw out a couple of new pictures that have just been taken in the last few days. Indy was spoiled once more with an indoor junglegym which he loves! Especially the swing since we can't go outside for a couple more months. Indy has learned a few new words. "MA" is one that is vocalized many times during the day. Especially if I leave the room. He can also say "Whatcha doin?" (ok that's a little rough yet but he's working on it)...and in agreeing to something he says "Uh-huh"...in a monotone voice (I think that he's picked that up from listening to me on the phone.) Probably talking to telemarketers! Attention: Indy is going to be the Poster Parrot for the Parrots At Play 2005 Calendar! WOO HOO! 2/20/2004 New Pictures...Indy having fun with his toy box and toys. hhhhhhm what's in the goodie box today? What should I throw out first? Somebody come get my stuff! 5/22/2005 New update and pictures coming soon! Please feel free to us!